We are pregnant again. It's still early (9 weeks) but I'm showing just like last time with Koen. So, there is the good news! We are due May 28th which is our 7 year anniversary. Can I tell you all the different feelings I'm having? 1. When we found out we were pregnant, it made me mourn the loss of the child before. It made me sad that I was only 10% as happy as I was when we found out we were pregnant in July. Why? I think I was nervous to celebrate because I didn't want to lose another one. 2. I knew we were pregnant at just 3 weeks. I had pregnancy symptoms immediately and took 4 tests in that third week until I finally got the positive sign at 3 weeks and 5 days:) Yes, I'm impatient like that. 4. I'm a bit sad that an adoption never materialized in the time we were active. Like, not even remotely close. I know, we were active for only over a year but still, I thought there would be some activity. Our adoption is currently on hold. Our plan is to re-open it once the baby is a year old and hopefully adoption is still in our future. We never, ever planned on having 4 kids but if there's one thing I know, it doesn't matter what you plan on:) The only way I think we would not re-open it, or at least not for 5 years or so, would be if we were going to be having twins. 5. When I thought my thyroid was acting up in September due to the miscarriage, it was actually being stimulated by HCG. Apparently this can happen in the first trimester. I have a `very high probability' of relapsing (with Graves' Disease) when the baby is one month old but I'm not too worried about that right now. I will just get my blood tests and take my medication as soon as I need to. 6. I am going with a midwife this time which I am very happy about. It's not that I didn't like my doctor, but this is my last one and I have seen a birth with a midwife and it looked like something I would like to do. I am also planning on a VBA2C (vaginal birth after 2 C-sections). This is not an easy decision and we will see what the OB says about it. There are pretty much equal risks in a VBA2C and a 3rd C-section. The one thing that does freak me out is the 1.36% chance of uterine rupture (which is reduced if you are not induced etc). I don't want to put my baby at risk for this but at the same time, there are risks with the section too. The main reason for not wanting a C-section is that I don't want to have major surgery and have to recover from it. It is not fun, especially when you don't have the needed support (besides Gary). I don't have a mom that can come help me for a week. Although, I'm thinking of hiring someone...let me know if you have any ideas. I have a lot of time to figure this out (sort of) and at the same time, I don't want to think about it at all. 7. I have put my volunteer work with NILMDTS on hold. There is no way I could mentally do it while pregnant and I'm trying to deal with what I've seen/heard and not let it worry me too much. 8. I am incredibly thankful that I am able to get pregnant. I know this is not easy, or possible, for everyone and I don't forget for a minute what a blessing this is. I am trying to savour each and every minute of it because this is our last time on this journey, I can tell you that! 9. I feel tired. I need to get as much as I can done during the day because once 8pm hits, I'm on the couch and not moving. I am nauseated but not as bad as the other two times. I just need to stay away from things that are a bit too flavourful. I could drink warm beverages all day long. I crave california rolls and eggs. 10. It makes me so happy to see Kai sooooo excited about it. He was so happy when we told him and that night he kissed my belly and said, `Goodnight baby, I love you!'. He is really wanting a baby sister but has mentioned that he wouldn't mind a brother that he could name baby Mario. Kai's first response was actually, `Oh, I hope auntie Maria gets a baby in her belly too!' and later told auntie Maria he would pray for her to get a baby in her belly. I think auntie Maria is pretty okay with not having a baby in her belly right now:) Koen just says that he has a baby in his belly too (which is the same response Kai gave us when we were pregnant with Koen). 11. Gary is nervous and excited. He's nervous how I'm going to be pregnant, in labour, post partum (thyroid), sleep deprived etc. He is not a baby guy. However, I know he will be super dad just like he is to our two boys now. So, that's the news! We are excited and nervous and happy and scared and mostly just happy. I should also note that I am not putting this on facebook right now. If something happened, I wouldn't want to announce it to my 324 friends. Congratulations!!! I had tears in my eyes when I read this. I am very excited for your family. 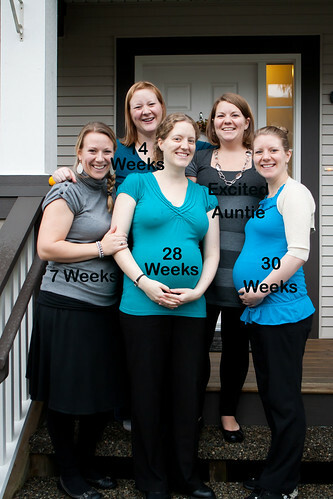 So fun that four of you are pregnant at the same time! We'll be praying for a healthy pregnancy. I'm the first person to comment!!!! FINALLY!!!! Happy happy happy day - and yes, you do look a bit too pregnant to keep hiding it. Yippeeeeee!!! yay yay yay!!!! I am completely thrilled for you and your family. After your loss, I was praying that you would be pregnant again soon. I can't wait to follow along for the coming months. You look fabulous too. I love the first picture of you. Yay! And I LOVE the belly! Congrats!!! That is so incredibly exciting!!! Congrats, babe! 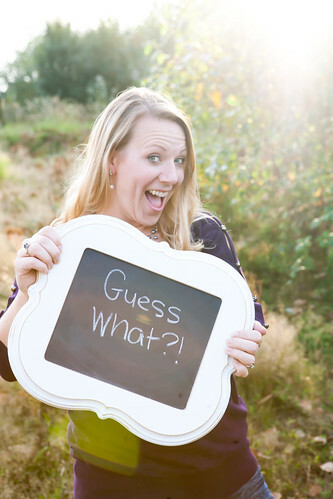 xoxo I'm so excited for you, and it will be fun to be a small part of it all :) It's amazing, how you do it all; business, baby, thyroid, blog, momma, wife, etc, etc... You do it all with style. You amaze me, and it inspires me. If you can do it, I must be able to also. (not the pregnancy part; I'm done with that! =) You've sacrificed a lot for your family, and still manage to keep a sense of yourself as an individual, and allow yourself room to grow and learn about new things all the time. It's pretty cool. Yay! I've been hoping for this post. the pic wi your sisters is crazy... your poor dad will never keep the grandkids names straight! I hope you can enjoy the pregnancy. Awe! Yippee! Congrats Louise, so exciting! I can't wait to watch this exciting journey via blogville. YIPEEE!!! WoW!! Congratulations everyone! Super exciting for you! Will continue to pray for your family & the plans God has for you all!! :) Wonderful wonderful wonderful news! Congratulations - praying that all goes well! 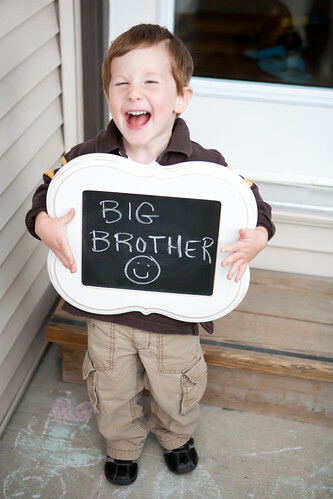 :) yippeee --- another chapman niece or nephew..very excited for the addition to our ever growing family!! Yay! Congratulations! Very cool that you get to share the journey with your sisters! Congratulations Gary & Louise!!! What fun, being pregnant at the same time as three sisters! My guess it twin girls:) Very excited. Mom would be sooooo thrilled!!!! YAYAYAYAY!!! Congrats!! So exciting. I love the belly. Congratulations to you and Gary!!!! Im so excited for you and I pray everything goes smoothly during your pregnancy!! yay! You look fabulous. Praying for a healthy baby and easy pregnancy. YEA!~ Im excited for another niece or nehpew! My guess is a healthy baby. and maybe a girl! !